Bring the stadium to your living room with these great deals on TVs and accessories. Kick off your summer of sport with some great saves on TVs and soundbars, courtesy of Tesco. The supermarket is the ultimate place to go for television deals this summer, with a whole host of kit ready to make sure you can watch the World Cup at home in style. Whether it’s a television you are after or some audio goodness, Tesco is ready to help you hear and feel every roar this summer. The range of TVs on offer is exceptional and caters for all needs. The line-up includes 4K televisions that will allow you to watch the big game in stunning clarity. A range of smart TVs that will make sure you are connected throughout the tournament and never miss a goal. Then there’s a fantastic range of soundbars, which are certain to bring the crowds into your living room. The Sharp LC-55CUG8052K is your ultimate superstar striker. It comes with a 55-inch 4K Ultra HD Smart LED TV with Freeview Play. This Ultra HD beauty has a vibrant and vivid picture from any angle, supports HD and comes equipped both with Freeview Play and Sharp’s smart TV interface which makes it easy to enjoy a range of preloaded apps including BBC iPlayer, Facebook, YouTube and Netflix (subscription required). Sound-wise, its speakers are supplied by Harmon Kardon. Tesco’s deal means that you can get it now for £399 - saving a massive £100. 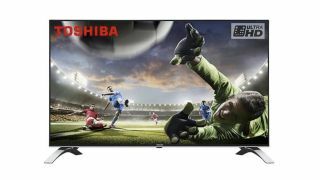 The Toshiba 49U5663DB is another fantastic television and quite rightly should be the captain of your living room. It comes with a 49-inch Ultra HD LED panel. 4K means that the television offers exceptional detail and clarity, while Toshiba Smart TV platform offers access to a range of on-demand content services like YouTube and Netflix (subscription required) plus built-in Freeview Play. The Toshiba 49U5663DB was £449 and is now available from for £349. This Toshiba 32-inch 32W3753DB television is a midfield general, offering Smart TV functionality, HD-quality images with Freeview HD built in. Wi-Fi as standard also means that you have a range of on-demand services at your fingertips, such as BBC iPlayer and Netflix (subscription required) - and having Freeview HD means access to some 70 entertainment channels, 15 of which are in HD! The Toshiba 32W3753DB was £299 but now has £50 off and yours for £169. The Sharp HT-SBW110 is one of the smartest soundbars around and is the ultimate super sub, thanks to its 2.1 channel sound and wired subwoofer. Sound-wise, those who like decent sound on a budget are in luck as the Sharp HT-SBW110 is the cheapest 180W soundbar, available through Tesco.. The Sharp HT-SBW110 currently has a fantastic £30 off, retailing at £99. Head to Tesco now for more deals to make this year’s World Cup one to remember.